I’m really liking the new bread maker… a lot! I like that that it makes horizontal loaves and I like having all the breads come out with a perfect shape and with perfect texture. I have been diligently following the instructions to check the dough ball during the first few minutes of the initial mixing cycle… and letting the dough ball tell me if I need to make any necessary adjustments. Usually I need to add less than a tablespoon of additional liquid. I would guess that this would change when the humidity levels do. We think this whole wheat honey bread is especially good. 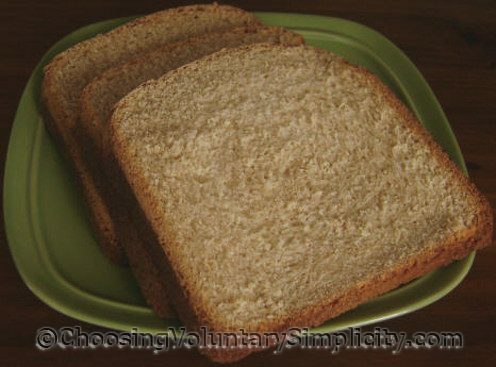 It tastes great, cuts easily, and is wonderful by itself or for sandwiches. I usually substitute white whole wheat for the all purpose flour to make loaves that are 100 percent whole wheat, but the recipe… as is… makes a very nice loaf as well. I use the basic cycle and the light crust setting. This recipe makes a two-pound loaf. The bread looks absolutely yummy! Would you mind sharing the type of breakmaker you have? Thanks for sharing all the information on your blog. I am really enjoying reading it. B.J., the bread maker we bought is this . It’s a very inexpensive bread maker and it is the best one I have ever used… and that includes one bread maker that cost three or four times as much. We have had this bread maker for about two weeks now and I have used it every day. Every single loaf has been perfect. You wrote that you have been diligent about checking the doughball in the first few minutes of the first mixing cycle. I have a bread machine too but I don’t know what that means and I think maybe I’m not doing something right because my bread doesn’t look like your bread. Would you consider doing a post about checking the doughball? What you look for and how to tell if its’ right. Thanks for sharing. This is a wonderful recipe. I made it and it turned out really good. My son that is 26 and eats a ton of sandwiches says it is better than the storebought bread he always liked best before so I thank you. You have a wonderful blog here. I really enjoy reading. I have made your recipe twice – once with the all purpose flour and once with the white whole wheat you recommended. Both came out really good.